1. You never could recognize your capabilities. 2. You are afraid of the unknown and are scared to try something new. 3. You don't know where to search and keep reusing the same sources. 4. You are anxious about potential interviews and what you might need to describe about yourself. 5. You don't think that you are qualified for most of the jobs you find. 6. You think you are too qualified for the other ones you find. 7. 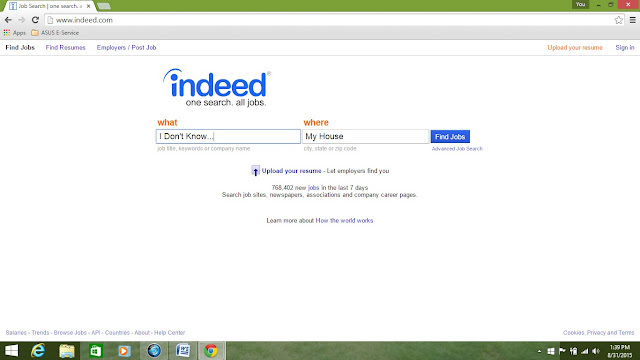 You waste more time Googling how to find a job than actually searching for one. 8. You spend too much time making your LinkedIn looking pretty. 9. You search for jobs that don't exist. i.e. "Extreme Lord of the Rings Fan"
10. You worry that a full time job will interfere with your social media accounts, resulting in a loss of followers that you worked so hard to gain. But seriously, check out my Instagram account @miisia - I post oatmeal art almost every morning for breakfast before I eat it and it would be such a shame not to be able to. 11. You have a headache and can't sit on the computer. Better rest up to feel better. 12. Your headache goes away, but you have a stomachache and need to lay down. 13. You are writing a blog post/making a YouTube video/complaining in your diary. 14. You need to make breakfast. Then you have to wash the dishes after breakfast. Then it is time to make lunch. Most people get an hour for lunch so why can't you. Time to wash the lunch dishes. Oh, look at that, now it's time to make dinner. Hmmm, it's 6:30 after you finish eating dinner? Phew, what a long day! Time to rest on the couch before going to bed. 15. You need to buy a Christmas present for your mom. It's September already? Better go buy it now before the crowds get crazy. 16. You want a job that combines all of your interests like writing, drawing, Instagramming, eating, watching TV, walking through forests, etc. 17. You look for jobs that are no farther than 15 feet from your house...gas is expensive nowadays. 18. You keep getting interrupted by the temptations that exist within the refrigerator. 19. You should check the new magazine that came in the mail right now because it might give you inspiration. 20. You'll find one tomorrow. 21. You have too many creative passions and don't know which one to follow. While these are just reasons why you might not be able to find a job, not actual helpful tips to come across that perfect position, they can help you think about any obstacles that are negatively impacting your job search. Taking a few moments to consider (honestly!) some of the reasons why you aren't finding a job can help you eliminate those obstacles from your job search. If like me, you get distracted by refrigerators and social media, maybe put a lock on your fridge or keep your phone in another room. Rather than wasting valuable time, be honest with yourself and cross off those job-search blockers. Instead, spend the time zoning in on your interests, acknowledging your talents and skills, getting a little more creative with your job search, and actually looking to see what is out there!